Our surroundings become proportionally more beautiful, IF I raise my head to see it when walking!! Tomorrow our most challenging phase begins. 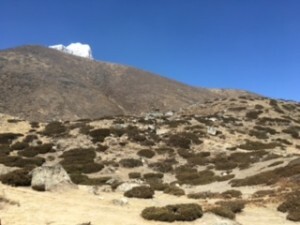 We are trekking to Lobuche (alt. 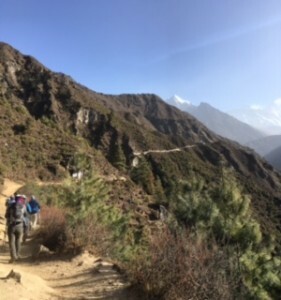 4910), with a steep hike taking us over 700 m higher than where we are today. On Easter Sunday we will reach Everest Base Camp! Just an additional 500 m… There our oxygen will be at 50%. 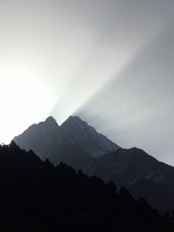 On the way back we will take a few hours rest at Gorak Shep, before summiting Kala Patthar at sunrise. I understand the view of Everest from the top is magnificent! Our accommodations become more and more… rustic, the higher we get. 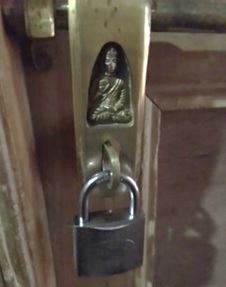 We are now staying in a plywood lodge, but with the most magnificent brass locks!!! The rooms are not heated, so please imagine the acrobatics that go on every evening and morning to stay as warm as possible.